Theoretically, one could make a sandwich out of anything. One shouldn’t, though, because there are lots of things that simply don’t lend themselves to the format. After spotting some gorgeous green and purple Brussels sprouts at the farmer’s market, I had to wonder just how they would fare. After a while, it was clear that the only way to test it out was to give it a shot. So I thought about the kinds of things normally served with sprouts, and in short order I had my game plan. If Brussels sprouts were ever going to work, they were going to work in this sandwich. Roasted garlic on the bottom. A layer of bacon over that, and deeply caramelized onions on top of the bacon. Then the sprouts, which had been tossed with salt and pepper and a touch of bacon grease and then roasted until beginning to brown. On top of the sprouts went some blue cheese crumbles and toasted walnuts, both scattered so as to not appear in every bite. Brown mustard capped things off, and the lot of it went between two pieces of sourdough, the particulars of which I will come to in a moment. Friends, I was struck dumb. It’s a feeling familiar to many enthusiasts, but I took a bite of this sandwich and then stopped, staring down at my hand. It was transcendent. Every piece worked in concert with every other piece, and together they formed a rich medley that was far beyond the sum of its parts. The roasted garlic was as delicious as roasted garlic always is, bacon was salty and savory (let it never be said that I am categorically against bacon), the onions brought a welcome sweetness that tempered the deep richness of the sprouts, and the bites were divided between being capped by a tang of cheese or an echoing nuttiness. It may seem that I stacked the deck, but I genuinely felt that sprouts had such a distinct flavor they needed all of this to create the harmony that a great sandwich requires. The nuts could probably go and they wouldn’t be missed, but with any other ingredient removed I feel like this sandwich takes a big step down. A note about the bread: Brussels sprouts, shaped as they are, present a great risk of filling creep. Even after being halved for the roasting, they still make for tricky sandwich assembly and even trickier eating. In order to solve this problem I cheated a bit, namely by selecting bread that had a nice dome to it. I used a miniature sourdough round, but anything with the proper shape will do. After slicing it in two, I went about scraping much of the bread out of the top half of the sandwich. This always feels like a bit of a betrayal to me – bread brings so much to sandwiches and here I am, telling much of it to get lost. But that’s the only way this works, is to hollow out the top half so that it forms something of a cap over the ingredients. When constructing the sandwich I left a clear lip so that the bread might be flush with the bottom half at the edges, and all together the sandwich was as manageable as could be. There was still some creep out of the front, but it really was as stable as I could reasonably ask. I am usually fairly conservative in my home sandwiches, preferring to let more skilled chefs explore the margins. But if a few more sandwiches turn out like this one, it won’t be long before I’m keen to put just about anything between bread. 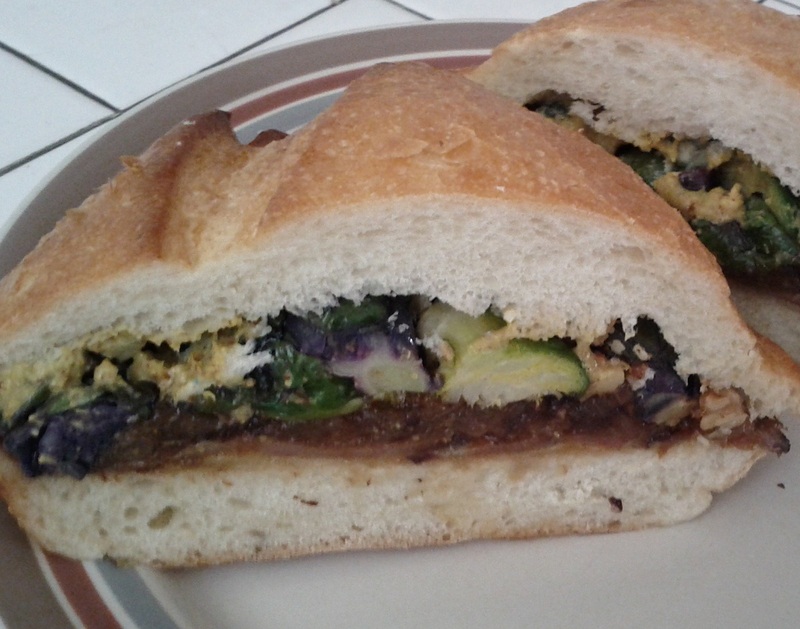 This entry was posted in Sandwich Reviews and tagged Reviews by Pete, Sandwiches I Have Made, Vegetarian by Pete. Bookmark the permalink.